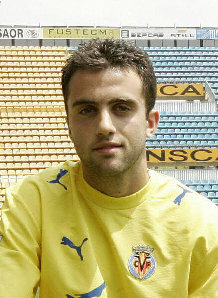 Guiseppe Rossi, the young Italian starlet, has signed for Villareal in Spain, subject to a medical. The La Liga outfit have paid Manchester United 6 million pounds for the rising star. With Rossi leaving, and Alan Smith seemingly on his way out, Ferguson and United most be confident that the Tevez deal will go through before the transfer deadline, leaving United with 4 forwards in Rooney, Tevez, Solsjaer and Saha. However if the deal can not be completed on time it would leave United short of options, until January, with only 3 forwards, and with Saha’s fragility, and Solsjaer out injured, would test Uniteds faith in their reserve forwards, or possibly leave them asking Giggs or Ronaldo to play upfront. There had been much speculation about the future of Rossi, who spent the second half of last season on loan at Parma, scoring 9 times in 17 matches, helping the Serie A team avoid relegation. Interest from Milan, Juventus, Fiorentina, Napoli, Porto and Parma had been expressed, however the move to Spain has come as a complete surprise. Villareal, who were looking to replace another former United player, Diego Forlan, who has moved to Athletico Madrid, had been after Julio Baptiste, the Real Madrid attacking player who spent last season on loan at Arsenal. However they bulked at Madrids asking price, probably inflated with interest for the Brazilian coming from Milan, and have moved quickly to secure Rossi ahead of a host of Italian clubs. Although never given a run in the first team, Rossi was well thought of at United, and having spent the last season out on loan, frustratingly at Newcastle and then successfully at Parma, was expected to join the fight for a United first team start, particularly with worries about Solsjaer and Saha’s fitness. However with the forthcoming arrival of Tevez, whenever that finally happens, Rossi looks to have taken the offer of a better chance of first team football at Villareal rather then sporadic chances at Old Trafford. The American born forward was invited to a pre World Cup camp by the then USA national coach, Bruce Arena, however Rossi declined, stating his allegiance to Italy. Although not known to much in England, outside United fans, the diminutive forward s highly regarded in Italy, as was seen by the number and calibre of Italian clubs that were said to be interested in him. United fans will be disappointed that one of their bright young stars has gone, or been allowed to leave, and having followed his superb performances at youth and reserve level, would have loved to have seen him in prolonged first team action this coming season. However, as much as Rossi wanted to prove himself at United, having sampled a run in first team football at Parma, it is understandable that he did not want to sit around waiting for fleeting chance at United. The good news for those United and Rossi fans is that United have included a clause in the contract, a buy back option, that could see Rossi return to United in the future. If he does so, after a couple of seasons playing regularly in La Liga, it could ultimately benefit United in the long term. You are currently browsing the archives for the Villareal category.